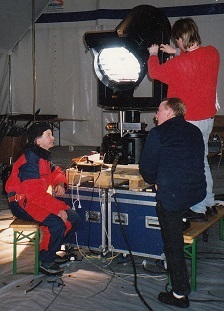 It is now 25 years since the 1994 Winter Olympics was opened on Lillehammer, Norway, with control electronics from Novatron in use at the main arena in Lillehammer. We delivered the motor control units to 8 remotely controlled searchlights used at the main arena. The control modules was part of 8 searchlights placed around the arena, 6 mounted in towers around the cicular arena and 2 alongside the skijump, and they were used as remotely controlled spots used during the opening and final ceremony. We are proud to be one of the many contributors that made the 1994 Winter Olympics to the successful event that it became. Novatron AS is located in Tistedal outside Halden, Norway, and have more than 20 years experience in designing and manufacturing electronics for different kind of use. Products includes everything from customized function keyboards and operator panels for offshore oil-rigs, ships and land based industry, remote control systems for demining machines, telemetry- and control-solutions for UAV's and GPRS based systems for collecting and distributing intermediate timing in orienteering sports. Do you need electronics to control a machine you manufacture or du you need to sit in your office and remotely monitor values on some equipment your company have delivered. Regardless of your specific demand - as long as there is electronics and software involved - we can be your supplier. We can build systems from standard off the shelf modules or design electronics and software from from scratch - customized according to your specific demands - and of course, with the environmental protection you need. Regardless of size and complexity - take contact and let us together see how your specific demand can be solved.